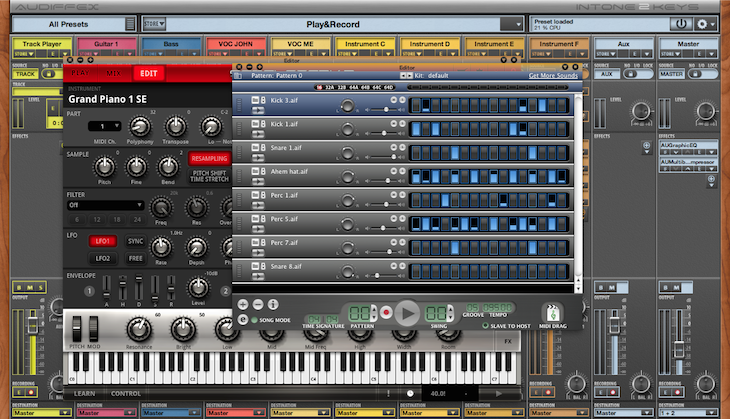 Audiffex has released inTone 2 Solo, a live FX Processor and virtual instrument host. It is a light and free version of the inTone 2application. Its limit is track count. inTone 2 Solo features almost 40 FX plugins, one track player, one audio track one instrument track, one AUX and one master chain. The effects in the application are identical to the Pedals bundle. They include amp simulations that allow you to create amplification stacks for guitar, bass or vocals. The audio player allows a user to slow down tracks without change of tune or to change the tuning. Therefore it is ideal for music students, for practising. Also it can function as a Karaoke machine.